Laser Weld Creation represents laser technologies and equipment in the North American market and facilitates their implementation into production complexes. The company employs specialists who have broad experience in the implementation and operation of laser technologies and are capable to do R&D. 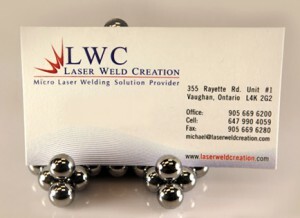 Laser Weld Creation Inc. has years of experience working with hi-tech companies, in particular, manufacturers of medical devices and dental equipment. OUR COMPANY PHILOSOPHY FOCUSES ON QUALITY, EXCELLENCE AND EXEMPLARY CUSTOMER SERVICE. Laser Weld Creation is established with the purpose of assisting enterprises to improve their manufacturing process by introducing new and existing laser equipment. This site is dedicated to industrial laser technologies, namely laser welding. Today, all manufacturers are familiar with laser cutting. Many companies use various types of laser cutters in their production process, and laser marking is gaining popularity. Laser welding, however, is mainly used for welding subminiature components in instrument making industries. For this reason, it is important to emphasize that a lot of development of technologies and equipment for industrial laser welding has been carried out worldwide. This research progressed to the point of designing real technologies applicable in production, as well as performing many trial weld joints with certification purposes. In some cases these technologies went through industrial implementation. Today, when manufacturing enterprises are faced with the necessity of using laser welding technologies, they should know that they do not have to bootstrap this technology or look for suppliers across the border. There are highly skilled technologists and scientists in Canada who specialize in various aspects of laser welding technology.